NEW LIE: BLAMING THE SUN - AGAIN! The article suggests the Sun's magnetic structure is changing from a dipole (N. Pole – S. Pole) to a "quadrupole structure" where the arctic and antarctic poles each contain two poles, all with North Pole characteristics, while the Sun's equator region contains the associated South Pole characteristics, as illustrated above. The article further suggests this phenomena may result in cooling of the Earth, or "temporary suppression of global warming". Clearly, this is yet another Main Establishment Lie feebly attempting to blame the Sun for the increasing Earth wobble, the many severe magnetosphere deformations observed on the NICT magnetosphere simulator, as well as the COW's fabulously orchestrated magnetosphere reversal that occurred in March of this year. It is no coincidence this article appears in Japan's mainstream press given the abrupt termination of Japan's NICT MagSim immediately after the infamous magnetosphere reversal. As recorded in the magnetosphere deformations blog, Earth's magnetosphere has been undergoing severe compressions with increasing frequency since 2010 and during a period of unusual dormancy in the Sun's 11-year magnetic activity cycle. The Zetas have long predicted the Establishment would blame the Sun for the many abnormalities visited upon the Earth by the unstoppable approach of Planet X. This is simply another example of Zetas Right Again! Below is a compilation of Weekly ZetaTalk Newsletters that address the many aberrations of Earth's magnetosphere caused by Planet X.
August 2, 2009 and this one has detail on how it does NOT correlate with solar activity. July 13, 2008 including an article claiming Earth field just went whacky "since 2003"
has zoomed in from space, and they have already begun laying the groundwork for this. the official magnitude of quakes. Attempts to relate the increase in earthquakes and volcanic activity to Global Warming (weight of the seas) or solar activity have not succeeded, in the public eye. Fracking, as an excuse, is being pushed in the media, but likewise lacks a firm nexus with quake location and timing. Since great earthquakes and volcanic eruptions have occurred in the Earth’s past, pointing to such instances will continue be used to explain the current increase. That our 7 of 10 predictions are unfolding as predicted will be ignore, as the cover-up hopes for continued media suppression on ZetaTalk. failed as the Sun refused to cooperate. What the cover-up wants is a way to EXPLAIN the magnetic twisting, as too many examples of the Magnetic Simulator graphs are alive on the Internet, raising questions that refuse to go away. The Earth wobble is the most troubling aspect of the near presence of Planet X. The public notices the Sun rising and setting in the wrong place, even when they have never heard of Planet X or the Pole Shift warnings. As the wobble gets worse, these questions become more pressing, and where stone walling may avoid a confrontation, it tends to suggest that NASA and other scientists are hiding something. What to do? The cover-up artists have decided to INVENT a reason the Earth’s magnetosphere was so twisted, and a reason for the Earth wobble, in one imaginary aspect of the Sun – the quad poles. Ah, it is the SUN, as they have so long claimed, that is creating magnetic confusion, and when one of the Sun’s N Poles points toward Earth, voile it creates a wobble by pushing the Earth’s N Pole away! Will this succeed? Only those members of the public so emotionally dependent upon a parent figure that they will cling to anything the establishment tells them will believe the Frankenstein Monster the cover-up is producing. - After years, more than a decade, of belittling Nancy and ourselves over our statements that Planet X had arrived in the inner solar system in 2003, they are now planning to wisk a NEW planet in from beyond Neptune as a substitute. We have photos and images, they have nothing, but they hope to replace our evidence with their lies. They FAIL as the increasing visibility of the Planet X complex PRECEDED their new story. - After almost a decade of twisting Magnetic Simulator graphs, and after taking the simulator DOWN on some flimsy budgetary excuse, they are now going to claim they have the answer! Since all this happened after 2003, when Planet X arrived, per our statements, they are late with their explanations. We have the images and they do NOT relate to activity in the Sun. FAIL, once again, as too many years have passed while they ignored the phenomena. 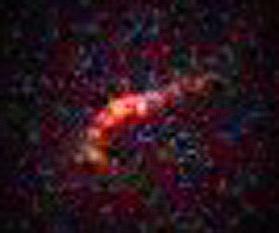 - The Earth wobble has likewise been in place only since Planet X arrived in the inner solar system in 2003. Why has NASA failed to MENTION this, while also ignoring the Moon’s errant orbit. NASA points out into space, attempting to wow the public with Hubble images, and can’t be bothered with anything involving Mother Earth? FAIL, as the increasing visibility of the Planet X complex, obvious NOW, will be seen as the obvious cause. No debunking and disruption. Debunking and disruption will lead to a ban. If you do intend to embrace any main establishment lies you will be suspended without any explanation. REASON paid debunking teams can completely disrupt discussion, as has occurred elsewhere. Did you get the Establishment's memo? "Earth Changes and the Pole Shift" and ZetaTalk® have been striving to inform you about the upcoming cataclysms, with the truth. The Establishment, people in positions of power and intimately responsible for the current status quo, do not want it to be that way. They are busy trotting along their lies through their minions around the internet, including this Ning and other means of mass communication, by using agents of disinformation. If you have just arrived to the Earth Changes and the Pole Shift, we intend to help you sort out the wheat from the chaff when it comes to the reality of Planet X, what it's doing to our planet Earth, and discard what you will soon find out are lies you were told. But. . . does NASA lie? You might ask . . .
NASA has acknowledged that Solar Cycle 24 can result in large solar storms that could be catastrophic for humanity. The Zetas have said that NASA blamed the sun and will not admit that the magnetic disturbances are generated by the planet X. If NASA knows something and has hinted that information, we may deduce that they have calculated the passage of Planet X in those years. ( http://science.nasa.gov/science-news/science-at-nasa/2006/10mar_stormwarning/ ) I wonder: Absolutely all the information supplied by NASA's solar flares in 2012-2013 and the consequences on earth are lies to hide the real causes? There are many ways to lie, and NASA uses all these means. One lies by boldface statements that are lies, and NASA does this by openly stating that Planet X is a rumor and not a reality. So given that, why would you even be asking if what they say about the Sun is truth? Because they mix truth with fiction, which is yet another way to lie. Of course there are solar cycles every 10.7 years or so, the last solar maximum occurring in March, 2000. Do the math! At present you should be into the next solar maximum. It should be now. But are you having massive CME's as occurred in the year 2000? No! This photo is of a year 2000 CME, X class. In order to hype the 2012 lie, that nothing will happen until December 21, 2012, NASA moved the date of the solar maximum to 2012, yet another lie. At present, because amateurs have scopes and can view the face of the Sun, NASA cannot simply invent a large CME, but this does not keep them from getting in to the news, prognosticating that the Sun is about to explode into activity, because they are frantic to blame the Sun for the Earth changes. This, despite the fact that this solar cycle is so sleeply, with such a lack of sunspots, that it is almost breaking all records. When their own images and archives show the presence of Planet X they allowed their archives to be doctored to appear that these anomalies on the SOHO images have been present all along. Inserting erroneous data is a lie too, but they have not stopped at the SOHO doctoring, as doctoring the SOHO background of stars and planets has been a practice since 2003 when the Earth stopped in her orbit. Edit lines, evidence of cutting and pasting, have been present since 2003 also. Silly explanations for evidence of Planet X in the solar system is also not beyond NASA, who will say anything but the truth on this matter. When the Moons of Planet X appeared on solar images, and the issue went viral on the Internet, NASA declared them a "compression artifact". The irrepressible Moon Swirls of Planet X showing up on the SOHO images were claimed as asteroid collisions only recently caught on film by NASA, or so they said. So you are asking if you should discount everything NASA says about the Sun or pending solar storms? With a track record like this, the question should be why any intelligent person believes anything they say! Do you not have a brain? Are you endlessly gullible? Do you lack evidence of their lies? And given that the larger the lie, the more reluctant the liar is to admit their guilt, do you expect NASA to change? We presume the answer is obvious. As Nancy has been stating, excuses that they can point to are desperately needed. They have used global warming and solar activity as their mainstays, announcing this over the years that the sun was very active and that global warming was proceeding faster than the models predicted. So how can they explain earthquakes, how can they explain increased volcanic activity just as with the face and dark global shuttering that is following along the lines of what we have explained and pointed to. They have no explanation that fits with global warming or with solar activity. You can either ignore it or you can try to twist what's happening into a global warming explanation. Well this is an example of that being done. The weather can be pointed to as a global warming phenomenon. Air heats up and the turmoil increases and this affects the weather and the weather creates earthquakes. That's why we have a rise in earthquakes. Good try fellas but if that were the case then why was there no correlation mentioned in all the many centuries before. It's a false connection. Frantic to maintain their cover story, that the Earth changes are caused by the Sun and not a mythical Planet X - NASA immediately grabbed media attention with predictions for what they called a "solar tsunami". At this point in the solar cycle, the Sun is approaching the solar maximum, and should be having sunspots and CMEs, and a C3 class flare is a minor affair. Yet in using a word like "tsunami" in the media, NASA's predictions implied something dire. NASA announced the discovery of a Coronal Mass Ejection (CME) on August 1, 2010. The CME resulted from a class C3 solar flare and was aimed towards Earth. The coronal mass ejection should reach Earth on the night of August 3/4, 2010. The CME will cause a higher than normal possibility of aurora, also called northern lights, activity on the evening of August 3 and the morning of August 4. Geomagnetic field activity is expected to be at quiet levels during most of day 1 (02 August). An increase to unsettled to active levels is expected late on day 1 due to the arrival of the full-halo CME observed on 01 August. Activity is expected to increase to unsettled to active levels with a chance for minor storm levels on day 2 (03 August) as CME effects persist. Activity is expected to decrease to quiet to unsettled levels with a chance for active levels on day 3 (04 August) as CME effects subside. Per the Zetas, NASA was risking a flop by this media barrage, but unless the public would associate any electromagnetic disturbance with the Sun, their cover story risked being debunked. Since a C3 event is tiny, as solar flares go, they immediately took their SOHO satellites offline for "bakeout" maintenance so the non-event could not be viewed. 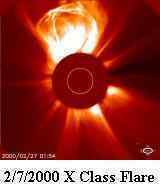 Compare the August 1, 2010 C3 with an X class flare that occurred during the last solar maximum in 2000. See the difference? ZetaTalk Prediction 3/6/2010: The excuses they planned to use were to blame the Sun for any electromagnetic problems, and they still plan to do so even though the severe interference with the Earth's magnetosphere started while the Sun was virtually asleep. They will grasp at every minor CME as proof of this theory. They had planned to blame rogue asteroids or asteroid swarms for the moons and debris in the tail of Planet X, and have already mustered this excuse forth, claiming that asteroids crash into each other producing dust clouds. Thus, the many moons seen on SOHO and the Stereo images, with a drifting tail of dust, were to be explained away. By inferring that the Chile quake altered the rotation time span of the Earth, they are trying to put into the public's mind the idea that quakes can affect rotation. Global Warming of course was to be the excuse for rising seas caused by heat rising from the core of the Earth, though this has now been taken from them. Any additional excuses they muster forth will not be believed, as what is about to unfold will take them by surprise! But this has not stopped NASA from continuing their campaign. Trust us, they say, the Sun is going to do horrible things! They are still warning of a worst ever solar maximum, despite the fact that that Sun is simply not cooperating. The effect [of Solar Flares] on Earth is in the realm of energy disruption, a surge of the various energy arenas that humans are aware of and others they are unaware of. Solar flares affect the activity of fish and kelp in the sea, in that water bends and deflects some energy rays and thus concentrates them. Just as humans find themselves more restless during a full moon, life in the sea is a bit more restless during solar flares - energized. Solar flares do not affect the core of the Earth, nor are they causing increased earthquake activity. This explanation by the establishment for increased activity in the Earth's core is to avoid mentioning the approach of the 12th Planet, and is easily rebutted. Have sunspots resulted in earthquakes in the past? Spanish astronomers have supposedly located a brown dwarf near our solar system, on a loop bringing this brown dwarf fairly close to the Sun! Scientists at places like NASA and famous observatories have deflected inquiries about the discovery for a few years now, mainly because they feared being associated with these "fringe" theories. But like it or not -- it has happened. According to a team of Spanish artronomers who call themselves the StarViewer Team. The group made the rounds of all the news web sites in the past two weeks, claiming they discovered something very significant. It's almost twice the size of Jupiter and just beyond our furthest planetoid, Pluto. Although it's not a planet, it appears to have planets or large satellites encircling it. It's what astronomers call a "brown dwarf star" and its official name is "G1.9". The newly discovered brown dwarf is reported to be located just about 60 to 66 AU (1 AU=the distance from the Sun to Earth) from us (its parigee), currently in the direction of the constellation Sagittarius. Ah, the perfect excuse! Now when the magnetic field is blasted, and there is no activity on the Sun to cover, NASA can claim that G1.9 caused this! The photo even looks a bit like the inbound Planet X did in 2003! Per the Zetas, this is all part of the plan, as this is a hoax attempting to duplicate the approach of Planet X in 2003.
together. Liars, all of them. ZetaTalk: Pole Reversals Note: written on Jul 15, 1995. The Zetas have long warned that in addition to blaming the Sun, the establishment would try to blame asteroid swarms for the increased debris in the skies from the tail of Planet X. We present a dynamical investigation of a newly found asteroid, 2010 SO16, and the discovery that it is a horseshoe companion of the Earth. The object’s absolute magnitude (H = 20.7) makes this the largest object of its type known to-date. By carrying out numerical integrations of dynamical clones, we find that (a) its status as a horseshoe is secure given the current accuracy of its ephemeris, and (b) the time spent in horseshoe libration with the Earth is several times 105 yr, two orders of magnitude longer than determined for other horseshoe asteroids of the Earth. Further, using a model based on Hill’s approximation to the three-body problem, we show that, apart from the low eccentricity which prevents close encounters with other planets or the Earth itself, its stability can be attributed to the value of its Jacobi constant far from the regime that allows transitions into other coorbital modes or escape from the resonance altogether. We provide evidence that the eventual escape of the asteroid from horseshoe libration is caused by the action of planetary secular perturbations and the stochastic evolution of the eccentricity. The questions of its origin and the existence of as-yet-undiscovered co-orbital companions of the Earth are discussed. There is no such asteroid orbit, as might be suspected since asteroid orbits have been studied for decades by the thousands and this is being first announced. Why? Because the debris in the tail of Planet X is increasing, and they need MORE excuses. We predicted that asteroid swarms would be one such excuse, and this is a variant. You should be vigilant and read between the lines, let your instincts guide you through the Establishment's barrage of lies and disinformation. Stay tuned to ZetaTalk chats on this Ning, and don't delay preparing.